SunsetScreen released! Similar to Flux, this is an amazing program to help you sleep better at night. Click here to find out more. Long overdue site-wide update to account of modern high resolution screens. A lot's been happening at Skytopia, but it's for pages of special interest - mainly software such as OpalCalc which has now reached version 1.70! SonicPhoto is our brand new program to convert from pictures to sound. If you've ever contributed or have emailed us before 2005 (or are a long standing reader/fan), email me and get a free copy of the Silver version worth $40. Opal CSV Converter allows you to convert from and CSV, HTML, programmer array and vCard if you get the upgraded version. New Mandelbulb gallery and videos found here - with a chrimbo theme! I've just spent the last 4 months working solid on an app called OpalCalc. I think it's the best calculator in the world (at least for Windows) for many different reasons. See what you think. Immortal 4 - Finally released, this has to be the greatest collection of Amiga music remixes ever made. It also has a remix of Turrican 2 - "The Desert Rocks" arranged by yours truly. So go there now and order a copy, or least listen to the samples! The Insidious Creep of Latency Hell - A degree of latency (delay) exists in everything from mobiles, TVs, and cameras, to the computers we use: LCD monitors, games, and networks. In this special feature, Skytopia charts some of the devices which are most prone to this near-invisible monster. The Unravelling of the Real 3D Mandelbulb - Probably the best article on Skytopia, and for so many reasons. Even if you don't care about the background and science, your jaw is sure to drop over the amazing 3D fractal pictures and animations contained therein. Brand new article again - this time we explore the potential applications of an "infinitely fast computer. Launch of our "Everything OLED" blog - a technology which promises to take over the world, or at least replace our existing LCD/plasma TVs and CFL/incandescent light bulbs. Updated graphics for the main categories - the Art Gallery, Leisure Zone, and Whirlpool of Knowledge. The art gallery in particular looks about one trillion times better. MegaDJ v2 - Mediamonkey is the best music player (yes better than Winamp, iTunes, or WMP), and MegaDJ is probably the best music search/jukebox extension around. Together, they can't be beat. Updated C64 page with many more scene/demo tunes. Also there's a SuperMagnet page update - This is the best SuperMagnet vid yet! Witness the "Chaotic Bouncefloor of Doom" at Youtube, or download the high quality video at the end of the SuperMagnet page. SuperMagnet page update - The "Super Mincer" animation has been upgraded to include full music and sound. What are you waiting for - download it now (or see the lower quality version on YouTube)!. MP3 Player Giants Rematch - An update to the MP3 Player Giants article - we have a new winner! Mystery of the REAL, 3D Mandelbrot Set - Don't be put off if you're not interested in fractals; this is light reading, and contains an awesome 3D gallery at the end. MP3 Player Giants Rematch - Winamp versus Mediamonkey versus iTunes. A massive update from the one we did three years ago! Happy New Year all from Skytopia! As a treat, enjoy the new wonderful 3D animation in the stereoscopic gallery. We've also added around 75 more pieces to the Greatest Classical Music page. Create 3D anaglyph or stereo images from two photographs/pics. It's easy as pie, and Stereoptica supports so many features that are lacking in most programs of this sort out there. The beginnings of a brand new page are again in progress - this time we tackle the greatest classical music, and list over 200 classics you're sure to love (even if you've never heard of them before!). Finally, for the more academic amongst you, the music scale page now contains my full dissertation. Find out the secrets behind the 12-note scale! Tips on how to Save Energy - We discuss informally how heat is the biggest killer in terms of electricity consumption. Included is a detailed list of appliances, how much power they use, ways to save on heating your home, the dreaded 'standby mode', and the future of energy. The Amazing Zeppelin Bend and Grapple Hitch - Ever needed that perfect knot to yank a bad tooth out, or extend a bungee rope so you can dangle further down a cliff face? We cover the only two knots you'll ever need. Overhauled Convert Java from/to C/C++ Massive update for all you budding programmers out there. Now I cover most of the common commands in Java and C/C++, with a dynamic table so you can choose what info to see. Updated Battle of the web hosts page - now it's (sigh) nonprofit, with no affiliate links. Full details on the page. Cool Anims - New page alert! A variety of humorous, 3D, cartooney, avatar-esque or simply weird animations created with various programs on the Amiga. Although (some of them) are beginning to show their age with respect to resolution and colour quality, they're still classics! Also added new MP3 to MIDI article and updated graphics for Fruit Emporium a few days ago. Some music related stuff now. Over time, I have gathered together many questions about the fundamental nature of music, and decided to create and maintain The World's Most Unanswered Music Questions. Also added a page on the 30th/06/06 dedicated to seeing how well software converts from MP3 to MIDI. It's easy for us, but computers hate the problem! Pulsar Overture - A new piece of music on Skytopia. This one was created for my uni coursework on a Mac with the Reason software, but I feel it is worthy to put on here too! It has a driving beat and bassline, as well as rich timbres and harmony. Take a listen. MIDItransform is a MIDI conversion web applet, and the first of its kind on Skytopia. Simply upload your favourite song, and change the volume, volume contrast, speed, key, and instruments of MIDI files! We think you'll be particularly impressed with the groundbreaking mode adjuster, where you can hear your favourite music in the opposite key (minor/major). Sleigh Ride remix - First AstraGrid, now this! Another Christmas present to you all. It's Sleigh Ride, but with a twist! Download in mp3 format. AstraGrid - Just in time for Christmas! It still needs sound and music, but this new game is a must play. What to do: Catch the disc, and aim it one of the pockets. But be sure to steer clear of the grid guardian - which will do everything it can do bump you off the platform. Two rather more specialized articles this time, mostly for programmers. A Java IO speed comparison, and a MIDI specification crash course. Learn what to use for input and output in Java, and how to manipulate MIDI data at the byte level. Something's been brewing, and it's time to spill the beans. A brand new page Mysterial Onera - Technology of Dreams is online. Find out about amazing dream technologies and not just how far off they are (if they ever arrive), but also what they're worth! Gravity Blockers, Sky Trains, Teleportation, the Terraformation Of Mars, Nanotechnology - this page has it all! Also added new Vanishing Fluff illusion and a short page detailing various light units. I've got more spare time now we're on our summer hols. What kind of stuff would you like to see on Skytopia? Email us your thoughts or write to the forum if it's up. Oh, and a big shout goes out to all you guys and gals at UEA music! It's official, the misc articles page is up! You'll find everything from opinion to raw information here. Examples include a comparison of the best MP3 players and an overview of how printers have progressed over the years. Polls are back up at last, though forums are still down. Fixed home page to display properly with the Firefox browser, and also uploaded the full version of the Super-Galactic-Mega-Mincer (tm) to the Super Magnet page. Enjoy! Extremely busy with uni coursework lately, but managed to find time to restore the Eclipse of Mars mono clips to the Soundburst page (lasting 10 minutes!). Look for the thin pale green section (under Grand Finale), and stream away! Sorry everyone that the forum has been down for so long. We're working to get (an upgraded version of) the forum back up as soon as possible. A new and cool 7 megabyte animation added to the Super Magnet page. Look for the "Collapsing bridge + rolling conveyor". The illusions page just keeps on getting better. The old Vision Distorter has now been heavily upgraded because I've ported it from GIF to an efficient lossless AVI format. Added amazing 'Rotating Snakes' illusion to the optical illusions page. New gallery picture - "Zydonia Beach" - A special Christmas treat - I hope you enjoy it! It has taken me around 6 months to finish, and is definitely the best pic so far in the gallery. Soundburst music modules - An entirely new page! Download all my classic music modules in MOD and MED format (playable through Winamp and DeliPlayer). Updated Fruit Emporium - now with more trivia than ever! Also vastly overhauled C64 page, with top scene/demo/arcade music, and the brilliant 'C64 Cavern'! Added Rotating 3D cube tutorial. Learn how to program a simple 3D routine. The relatively simple maths of translation, rotation, and scale is fully explained, and illustrated. Updated home page. 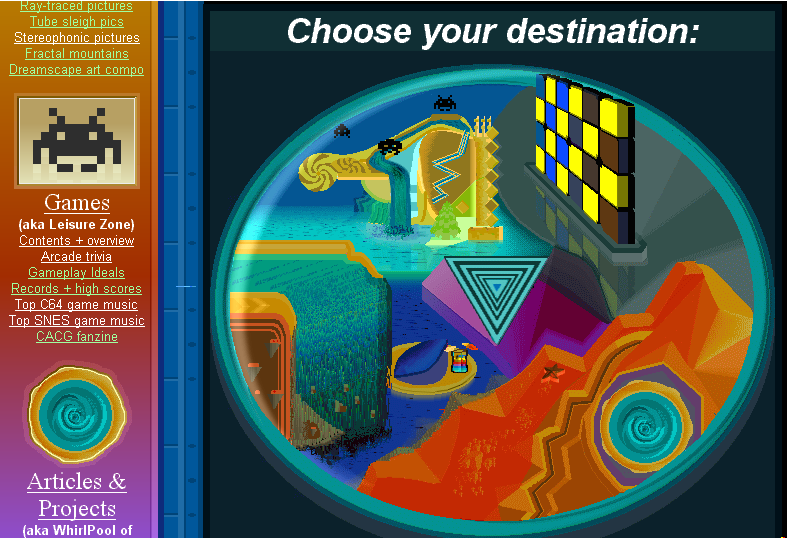 First off, the map is improved over the old one - with animation if you hover the mouse over each area. Other tweaks include better panel designs on the left. Click here to see the old home page. Also see this for a super luminous night map! Added brilliant new illusions from Akiyoshi Kitaoka to the optical illusions page. Massive overhaul of the Music Scale page. Important update to the Quest For Profound Truth page. A scientifically foolproof method of determining the reality behind the NDE. Help us find out if there really is an afterlife. Also scrapped the old chatroom, and arranged a weekly chat on Saturday - to increase the chances of people actually turning up :-) See right for details. An update at last, and it's a biggie! I've finally produced a music CD - 'Eclipse of Mars' which is now available for purchase. You can listen to demos of the music and a brand new track - "Martian Garage Party" - check out the Soundburst Shrine. I managed to get the forum working! (there was a bug in PhpBB's session table). Just tried to access the forum and found out there's a 'Critical Error' in 'creating a new session'. I have absolutely no idea why this has happened, but hopefully, the error won't last. Reconverted all the magnet animations to AVI format - all now at 50 frames per second!! Also uploaded a big portion of the MegaMincer. Visit here. Entirely new page up! Find out answers to some of the most important questions humanity has ever faced at the fantastic Quest For Profound Truth page. Updates to the Music Scale page and Optical Illusions page. Massive update to the Arcade Trivia page. Now contains extra trivia, and an entirely new page dedicated to comparing all the different versions (i.e. Arcade Vs C64 Vs NES Vs Spectrum). SNES music page is now split in two. This will make it much easier to view/vote on the polls. Also updated the Fruit Emporium with slightly better design/graphics. Yet another gigantic overhaul to the SNES music page. Table is now finally complete - and there are many other new features. Another update at last - and some new pages! First up are the brilliant The World's Most Unanswered Science Questions pages. Everything here - from the taste of liquid diamond to gigantic mirrors - is here. Also, I have included a page about why there are 12 notes in the scale. Visit here. Reached 10,000 hits yesterday! To celebrate, added cool polls to Optical Illusions, SNES music, C64 music, Fruit Emporium and Soundburst Shrine! Also tweaked SNES music page and added Parodius breakdown. Added 'Blind Spot' and the brilliant 'Eclipse of Mars' to the optical illusions. Also updated the Lucid dream page and added the cool 'Bubbles' animation to the Super Magnet page. A massive update to the SNES music page. The main table has been completely overhauled and combined into the main SNES page. Also added many more 'miscellaneous' SNES games tunes to the page. Skytopia's forum is back up! See the forum news for info on exactly what happened. Also updated 'Musical Evaluation' page (extra section etc. ), SNES music page (more screenshots) and Fruit page (many more fruit pics). Another update at last! Added the brilliant 'Mirror Timebomb' to the Light/colour trivia page. Lots of fruit pictures added to the Fruit Emporium page. Also added the 'Date' fruit. Added Skytopia chatroom. Also added the intriguing Wheel of Confusion to the Optical Illusions page! Mega-update to the Super Magnet page Further pictures, and full animations uploaded!! Added the brilliant 'Magic Zoomster' to the Optical Illusions page! Skytopia reaches the 1000 hits mark! Added 'Eternal mirror pic' to the 3D Stereoscopic gallery. Can you see it in 3D? Plenty of bug fixes for those who have the 1024*768 resolution screen mode. Added Skytopia Forum! Any comments, or general chat can be posted here..
Arcade Trivia page updated. Best arcade music is now listed - send up your favourites! Outrun is also now featured. Soundburst Shrine updated - music is now directly available to download! Massive overhaul to the Fruit Emporium page. New fruits added - 41 now! Also, further ratings for bitter/sweet and flat/sharp attributes. Many minor bug-fixes and tweaks. Thankyou for all your guestbook entries! Another cool update. What happens if you face two GIGANTIC 100 square mile mirrors together? You'll see /time itself/ fall apart - that's what! See for yourself at the Light/colour trivia page. Large update to the Impossible maths page. Can /you/ solve the mystery of the Mega-sphere? Massive overhaul to the SNES music page! Pictures, captions and further trivia added. Main table has now been given a seperate page and there are top tens for Secret of Mana, Kirby etc. Guestbook added! Message board will be added soon. Full C64 page has been finished. Arcade Trivia page complete and uploaded! New graphics and pics too. A few links still yet to be completed: C64 page, Fruit Emporium page and Arcade Trivia page. The first page (this one!) of the site is up.